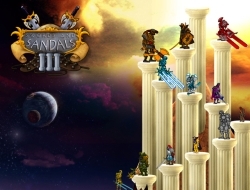 Finally, the third version of the Swords and Sandals game is here, all ready for you to play. This is an action game and the goal remains basically the same, meaning that you have to create your own champion gladiator and then play him in the arena. Choose his height and size, but keep in mind that you will gain or lose some stats depending on your choices. In this version, you can create even a spellcaster, that is alot more fragile than the melee fighters, but he has the range advantage but has to worry more about the amount of magika left. Try to win a few duel fights and gain some gold so you can buy more armor and better spells or swords. Swords and Sandals 3 10.00 between 0 and 10 based on 1 votes.